President Donald Trump speaks to members of the media before boarding Marine One on the South Lawn of the White House in Washington, Nov. 26, 2018. President Donald Trump's renewed demand for U.S. taxpayer funding of his proposed U.S.-Mexico border wall was threatening again on Tuesday to bring on a budget standoff and a partial government shutdown, leaving Congress just 11 days to act. With time running short, Trump and Republican leaders of the U.S. House of Representatives huddled at the White House. Border security was expected to be high on the agenda. By Dec. 7, Congress must pass this spending bill, estimated at $312 billion, to keep some government agencies funded, including the Department of Homeland Security, which polices the border and immigration. 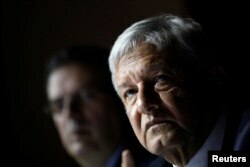 Mexico's President-elect Andres Manuel Lopez Obrador and his pick for foreign minister, Marcelo Ebrard, hold a news conference in Mexico City, Mexico, July 5, 2018. Migrants run from tear gas launched by U.S. agents, amid photojournalists covering the Mexico-U.S. border, after a group of migrants got past Mexican police at the Chaparral crossing in Tijuana, Mexico, Sunday, Nov. 25, 2018. 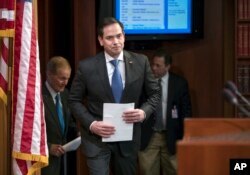 The latest border incident was unlikely to shift the partisan split in Congress over Trump's proposed, $23 billion wall, with many Republicans in favor and most Democrats against, Senator Marco Rubio told reporters in a Capitol hallway. 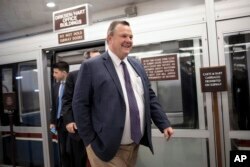 FILE - Sen. Jon Tester, D-Mont., arrives for final votes for the week, at the Capitol in Washington, Thursday, Jan. 25, 2018. ​But a House Democratic aide familiar with the negotiations said in a telephone interview that, at least for now, talks over Homeland Security's budget were "a total mess." House Republicans want $5 billion for Trump's wall, while the Senate wants $1.6 billion for this fiscal year. The Trump administration would like the entire $23 billion up front, fearing that a House run by Democrats next year would never fully fund the long-term costs of the wall. Under Republican control of the Senate and House in recent years, U.S. spending on programs to combat violence and promote the economies of El Salvador, Nicaragua, Guatemala and Honduras has declined sharply. At the same time, despite Trump's efforts to make immigration more difficult, the number of illegal crossings has risen. According to U.S. Customs and Border Protection, in the fiscal year that ended on Sept. 30, apprehensions on the southwest border of unaccompanied children rose 21 percent from the previous year to 50,000, while family apprehensions were up 42 percent to more than 107,000.